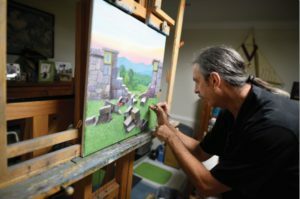 Armand is a full-time oil & watercolor painter represented by galleries across the United States. creating conceptual designs and background art. Napa Valley Museum,The Haggin Museum, IlluXCon and many other national exhibitions. He teaches studio and plein air painting when his schedule permits. Armand is often published in regional and internationally-known art publications. as one of the premier, contemporary painters in the country.